← Liberty Antiques Festival – Spring, 2017. 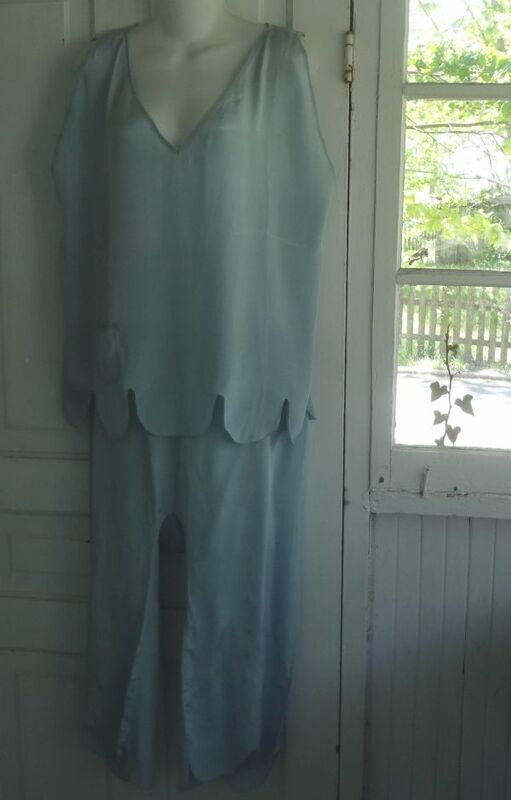 One of the great finds I made last week was this pair of 1920s pyjamas. The seller who had them is a regular at the antiques market, and she specializes in things other than clothing, but she usually has a rack of vintage lingerie as a sort of afterthought. They were mislabeled as nylon tricot, which was a bit puzzling. Anyway, I was happy to find them. Pyjamas from the 1920s are hard to find and I am glad to add these to my collection. Pyjamas are one of those garments that started to bridge the gap between what was acceptable to be worn in the home, and what was okay for public wearing. These are technically lingerie, but many women in the late 1920s followed the avant garde in Italy and started wearing these at the beach over their swimwear. There are several things that identify these as being from the 20s. Scallops were a common design feature of the time. They are seen on outerwear as well as lingerie. Also, the edges were finished with a picot stitch machine. 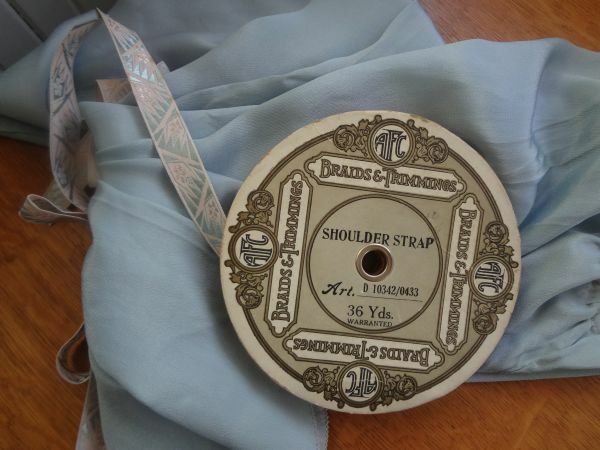 This newish invention was very popular in the twenties, as it worked so well with the flowy fabrics of the day. The legs of the pants are straight. After about 1930 pant legs got wide and flowing, much like the bellbottoms of the late 60s and 1970s. While examining the pants I got a little surprise. 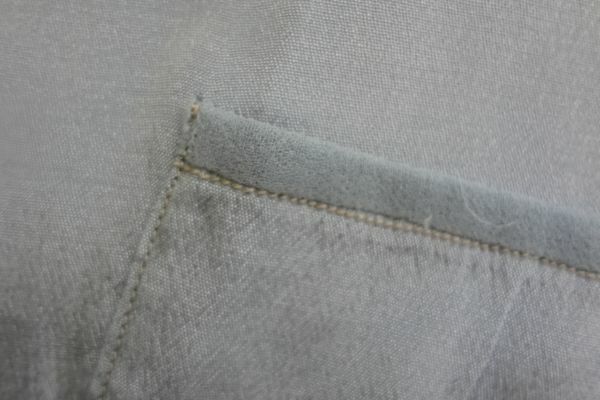 Near the hems were two little slits with finished edges. I’m thinking there were originally ties that gathered in the legs slightly. Here I have inserted a piece of ribbon through the slits to make a bow which puts a little pleat in the leg. 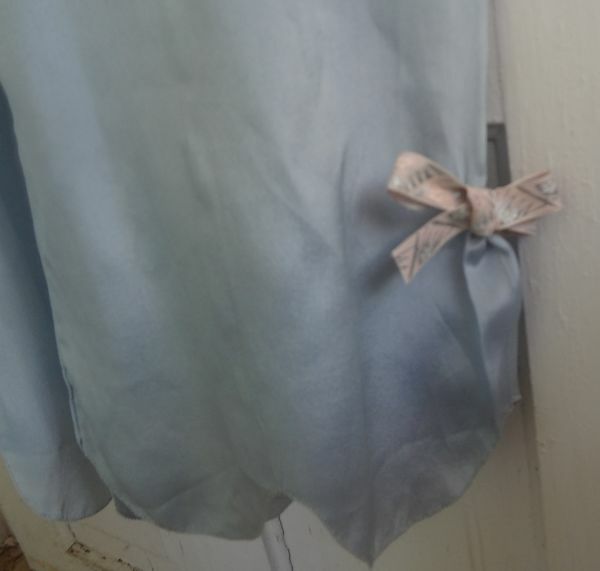 I have no way of knowing what the original ties were made of, but I do happen to have some 1920s ribbon in pink and blue. 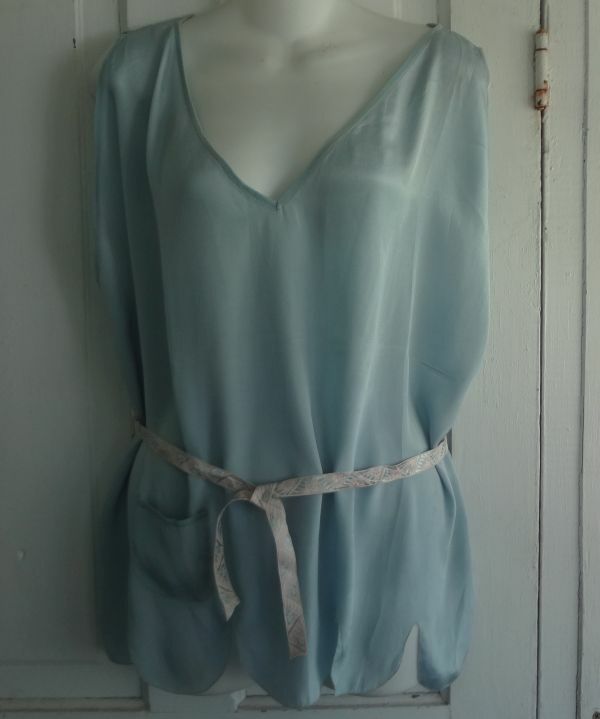 The top of the little pocket on the blouse and the neckline are finished with a gauze fabric that matches the blue rayon. It is possible the ties were made from this fabric. The blouse originally had a belt, as evidenced by the presence of belt loops. 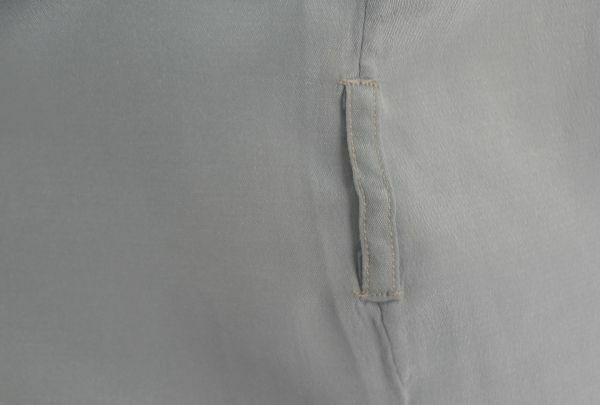 These are located on the side seams, slightly below the natural waistline, as one would expect in a 1920s garment. 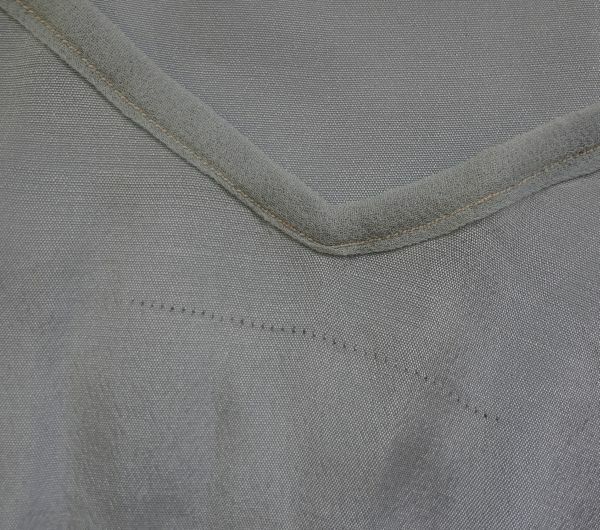 There is a line of stitching in the back of the neck. Could this mean there was once a label? 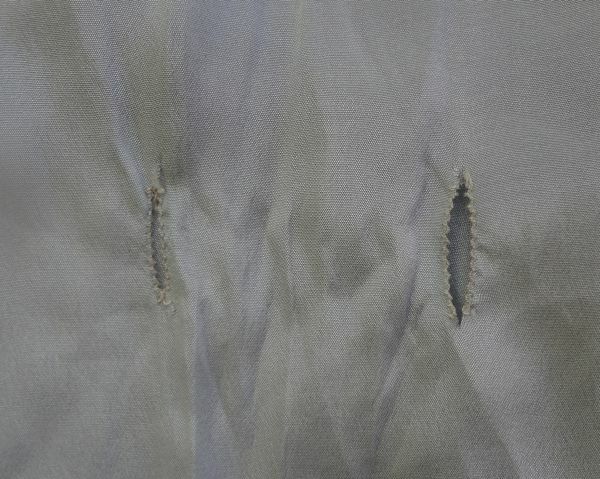 I’m not sure, as it seems to be an odd thing for a 1920s garment, but what would be another explanation? 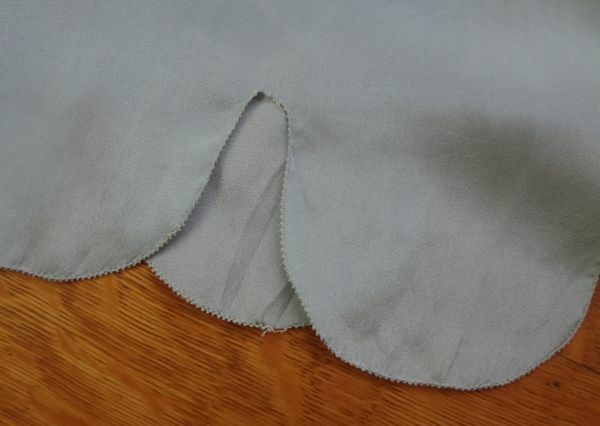 There are two different types of stitches in the pants. I’m pretty sure the pyjamas were commercially made due to the picot edging and the tiny French seams. But I also think the pants were shortened at the waist. 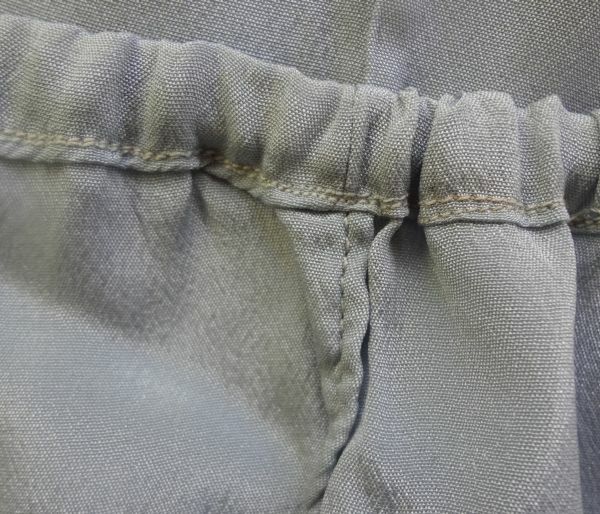 Note the vertical side seam, and the double stitched casing for elastic at the waist. The thread of the casing stitches does not quite match. In the 1920s most women were not wearing any sort of legged garments, so pyjamas were a big step in the move toward women wearing pants, even if they were seen mainly in the boudoir. Lovely. I hope you will wear them “at home”. I did have to try them on, and they fit. But I’m too rough on clothes to risk it on a regular basis! I love this post: the garment, the detective work, the photos. Thank you! Thanks so much! I love being a vintage detective. Thank you for sharing this close up view of a remarkable set, it’s one of those ‘real life’ outfits that usually were worn to death that we rarely get a chance to see. BTW, your ribbon choice seems perfect to me. I remember that women wearing pants were verboten at Naval Training Center in San Diego in the late 1960’s. Finally, the powers that be allowed women to wear pant suits. When I started teaching in 1977, women teachers had only been allowed to wear pants for about two years! Very pretty Lizzie! You did a post on lounging P J”S not long ago. Back to 70’s a designer – Holly Harp – designed a collection of evening p j’s that were very successful. These are reminiscent of her collection! Elegant -in crepe de chine / Japanese silk some with full short and longer loose flowing jackets. Usually a camisole -the pants – as you mention were full . This is a very unusual color for the period? I sold out of mine in my shop in Key West as soon as they came in! (funny aside) Margo kidder bought a petal pink “pair” and wore them on Jonny Carson – He couldn’t stop teasing her ! The blue is a bit unexpected, but really rare. Most lingerie of the 1920s was in the warm family of colors – pinks, peaches, oranges. We used to call that colour duck egg blue. Lovely. That’s a nice descriptive name for a color! So interesting. I love those! I would wear them now. Charming find, Lizzie…and so nice that you had that sweet 20s ribbon to add to the set. Oh, thank you for the details and observations! I think about this when I alter clothes, especially the vintage ones meant for wearing. Leave the seam allowances, leave a little trail.